Welcome to Week 2 of M15 Spoilers! A 3 mana 2/1 with Flash and Flying and has a great way to prevent abilities from happening. 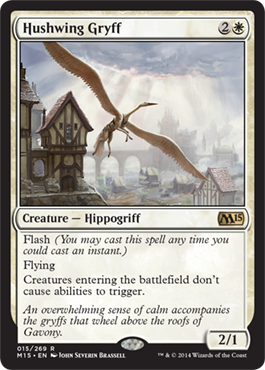 For instance, Hushwing Gryff prevents Constellation from firing. 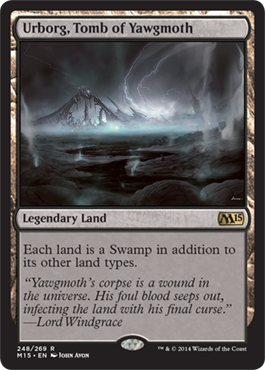 And one of the most expensive cards from Modern is being reprinted and it makes every land a Swamp. This is a powerful card that can make any land a dual land that can tap for black mana. This also allows for Swampwalk to take effect on an opponent's lands. Necromancer's Stockpile is a really powerful card. 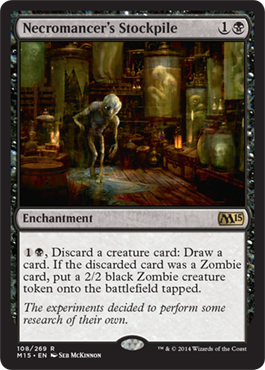 You can pay two mana to discard a creature card, already powerful given the potential for a B/G Dredge Deck in Standard, and also draw a card. If it is a zombie, you can put a 2/2 black zombie token onto the battlefield. Granted the token comes in tapped, but it it is still a pretty great card. 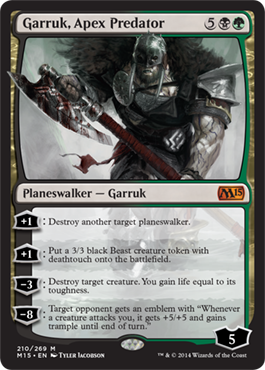 Ah, the Garruk we've all been waiting on. The first four ability planeswalker since Jace, the Mind Sculptor. This one has two +1 abilities, on of which destroys another PLANESWALKER. That's right. The other one puts a 3/3 black beast with deathtouch onto the battlefield. Then his -3 ability destroys a creature and gains you life equal to its toughness. The -8 gives an opponent an emblem, yes an opponent, that gives any creature that attacks that opponent +5/+5 and trample. This is a really groundbreaking planeswalker card being the first original multicolored planeswalker in a core set, the first planeswalker to actually be able to destroy another planeswalker, and then the first planeswalker to give an opponent an emblem. And... four for four for those of you keeping score at home. We are getting slivers, a Sliver land, enemy painlands, AND a B/G Garruk. Hope you guys have enjoyed this occasional list check whenever we get new information on M15. You won't see it again this week, I promise. Be sure to check out our spoiler page for any other spoilers you may have missed last week.